Olive Davis House was designed and constructed by James Walter Chapman-Taylor in 1928. It is a residential building of Arts and Crafts style located on a remote private reserve owned and managed by the Royal Forest and Bird Protection Society of New Zealand. Aesthetically, the humble form and scale of the house are in harmony with the tranquility of the site. The use of bespoke materials blends the building into the natural environment such that its presence over time has little disturbed the natural vegetation of the site. 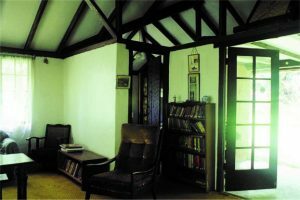 Technologically, the textured plaster render and hand adzed timber elements of the house are of considerable significance in demonstrating the revival of traditional skills in keeping with the spirit of the Arts and Crafts movement. Its unique site context required careful consideration in developing policies and recommendations in the conservation plan to ensure that both the conservation of the building and of the native forest are achieved appropriately. Consultation with stakeholders helped to form strategies that resulted in a conservation plan that can be read in conjunction with the existing reserve management plan.